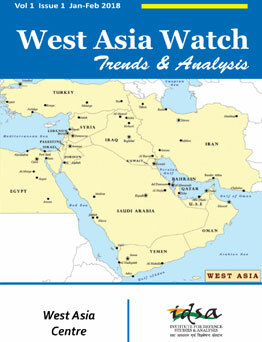 West Asia Watch is being brought out by the West Asia Centre of IDSA. 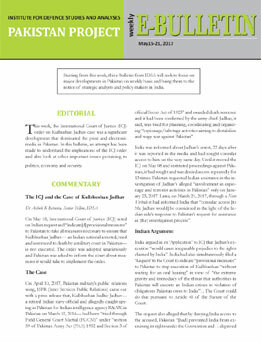 The aim of the newsletter is to monitor and apprise the larger community of scholars and students of West Asia as well as Indian policy makers on the latest political, economic and strategic developments in the region and their implications for India through its news reports, analyses and interviews. At a time when India is evolving a new approach towards the region, this venture seeks to generate greater awareness and keener insights for more informed decision making. POK NEWS DIGEST is IDSA’s monthly newsletter comprising news summaries, press releases and important statements related to Pakistan occupied Kashmir (PoK), referred to as ‘Azad' Kashmir and Gilgit-Baltistan by the Government of Pakistan. The POK NEWS DIGEST captures contemporary issues related to POK under the following categories:. Pakistan News Digest being brought out by the Pakistan Project team at IDSA. It is the latest addition to the News Digests being produced by IDSA. The digest seeks to keep its focus on all round strategic developments taking place in Pakistan on a monthly basis. It culls out information and analyses from the Pakistani media— both English and vernacular— and provides a ready reference material for the wider strategic community. As East Asia is growing, its economic and military reach compounded by its peaking influence has led to the great powers adjusting to the so-called shifts in International order. Keeping in mind the fast developing military situation in the East Asian region, the East Asia Centre at IDSA has taken the initiative to launch East Asia Military Monitor. East Asia Military Monitor is a bimonthly newsletter, focussing on the significant military and security developments in the region, particularly in China, Japan and the Korean Peninsula. This newsletter is intended for the policymakers and the academic community. The information is drawn from speeches, articles, ministries and regional forums with a special emphasis on area sources.